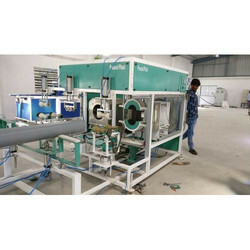 Prominent & Leading Manufacturer from Ahmedabad, we offer pvc pipe belling machine. By keeping track of current market developments, we are presenting an exclusive assortment of PVC (Polyvinyl Chloride) Socketing Belling Machine that is extensively used in various industries. Our skilled professionals manufacture this machine employing high grade components and advanced technology. For strictly adhering to the industry defined guidelines, we conduct a series of tests on the entire range to flush out any possible flaw.